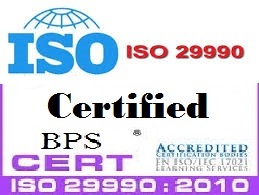 BPS focus on certification of companies to international ISO standards. BPS is an excellent certification body for ISO 9001:2008 ISO, 29990:2010, BQS IQAAF:2011 for educational Accreditation of Private Universities ,Autonomous Universities,Colleges and independent schools around the globe. BPS is the impartial and independent third party Conformance Assessment Body (CAB) and an accreditation body recognized by the Board of Quality Standards. BPS LTD is registered under corporate affairs commission, Govt of Nigeria mandated by the federal decree 1 of 1990. BPS operates their operation as per the International Standards prescribed by ISO such as ISO/IEC 17021:2011 and ISO/IEC 17020:2005 etc., BPS is Recognized globally as an accreditation body of quality in excellent education with established accreditation services for business school programmes, corporate universities and technology-enhanced learning programmes. The BPS is an agency of the board of quality standards. It provides your company with a set of principles that ensure a common sense approach to the management of your institutions consistently achieve customer satisfaction. Who is ISO 9001:2008 applicable to? Mission: BPS is to provide registration services for building confidence in products and services and for improving the competitiveness of companies and service organizations.